There is a fountain of living water that the woman of Samaria learned of when she was going to draw water from the well for Jesus, but HE told her of the water that HE could give where she would never thirst again meaning the living word that is the Spirit of truth. (John 4:10-14, 23-24). Jesus answered and said unto her, If thou knewest the gift of God, and who it is that saith to thee, Give me to drink; thou wouldest have asked of him, and he would have given thee living water. The woman saith unto him, Sir, thou hast nothing to draw with, and the well is deep: from whence then hast thou that living water? Art thou greater than our father Jacob, which gave us the well, and drank thereof himself, and his children, and his cattle? 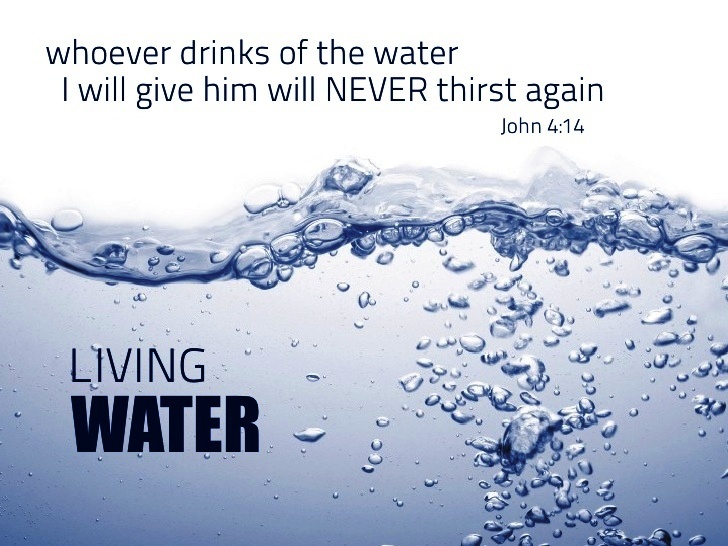 Jesus answered and said unto her, Whosoever drinketh of this water shall thirst again: But whosoever drinketh of the water that I shall give him shall never thirst; but the water that I shall give him shall be in him a well of water springing up into everlasting life. But the hour cometh, and now is, when the true worshippers shall worship the Father in spirit and in truth: for the Father seeketh such to worship him. God is a Spirit: and they that worship him must worship him in spirit and in truth. When God pleaded with Israel HE said they have turned from HIM to serve what is not god, to something that would not profit them. They had forsaken HE who is the fountain of living waters. (Jeremiah 2:11-14) Hath a nation changed their gods, which are yet no gods? but my people have changed their glory for that which doth not profit. Be astonished, O ye heavens, at this, and be horribly afraid, be ye very desolate, saith the Lord. For my people have committed two evils; they have forsaken me the fountain of living waters, and hewed them out cisterns, broken cisterns, that can hold no water. Is Israel a servant? is he a homeborn slave? why is he spoiled?…. (Jeremiah 17:13-14). The tongue of man is not easily tamed yet as a Christian the Spirit of God helps us to speak HIS words that are pleasing to God. It displeases God when blessing and cursing come out of the same mouth and HE even says this should not be so. (James 3:8-13). But the tongue can no man tame; it is an unruly evil, full of deadly poison. Therewith bless we God, even the Father; and therewith curse we men, which are made after the similitude of God. Out of the same mouth proceedeth blessing and cursing. My brethren, these things ought not so to be. Doth a fountain send forth at the same place sweet water and bitter? Can the fig tree, my brethren, bear olive berries? either a vine, figs? so can no fountain both yield salt water and fresh. Who is a wise man and endued with knowledge among you? let him shew out of a good conversation his works with meekness of wisdom. We see in revelation the saints arrayed in white robes are before the throne of God and they will thirst and hunger no more!, and they will be led unto living fountains of waters. (Revelation 7:14-17)…. (Revelation 21:6-7). And I said unto him, Sir, thou knowest. And he said to me, These are they which came out of great tribulation, and have washed their robes, and made them white in the blood of the Lamb. Therefore are they before the throne of God, and serve him day and night in his temple: and he that sitteth on the throne shall dwell among them. They shall hunger no more, neither thirst any more; neither shall the sun light on them, nor any heat. For the Lamb which is in the midst of the throne shall feed them, and shall lead them unto living fountains of waters: and God shall wipe away all tears from their eyes.